The supposed master of Giotto, Cimabue was born in Florence and written about by such figures as Vasari and Dante. 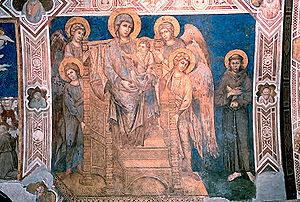 A painter in the Florentine tradition, Cimabue is seen as a transitional artist bridging the gap between Byzantine style and Giotto’s naturalism. The Madonna of Sta Trinita is generally accepted as an example of the artist’s work, some of which can be found in the Uffizi Gallery of Florence. Dante suggested that his great fame was stolen by Giotto.